"My joy and passion is Living from Source in every part of life that is mega practical, tangible, accessible and fun. It dynamically lights people up from the inside out feeling the empowerment, the awe and wonder of this grand connection to all that is from ones power place within ~ A true embodied experience of being the microcosm of the macrocosm, YOU as the universe in person uniquely expressed! This is where the constant stream of inspired creativity pulses from and new win-win personnel and collective stories birth. Source Living ignites the openness and activating of the more, the magical, the magnificent in every moment of everyday llfe. A new security is born as the miraculous unfolds in every now moment with mind bending, awe inspired synchronicity. The new game of living brilliantly and purposefully becomes the alignment to all that life is signaling for the greater collective upliftment which I call Living in the HighVIbes. My body of work is about supporting, facilitating and inviting people to access their own Source Connected Potential and feel the joy and mega power of this new embodied relationship for limitless creative possibilities made manifest. I invite people into a deeper, richer, fun and joyous connection with their amazing bodies of consciousness. No more a physical thing that needs to be exercised to stay healthy and in shape but as a place where people can move with the pulse of life feeling that pulsating through every cell, uplifting them into the experience of BEing the miraculous in motion where all limitation or old stories drop effortlessly away creating space for the new to emerge. It is ecstatic, sensual, blissful, exhilarating, super connected and full of graceous power and powerful grace. Life becomes a true celebration of every nuances, every breath, every conversation, every engagement. Nothing is wasted in consciousness and we feel the truth of that perfection. 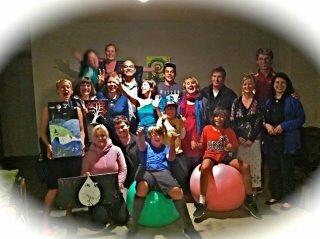 My joyous passion is co-creating vibrant Source Living community and I have done this where I reside in New Zealand. I support & facilitate highvibe living through various energetic dance & movement practices, Wellness & Yoga Retreat, Source Living Retreats. I also run a Day Spa from my home/retreat in New Zealand where we offer intuitive, balancing & uplifting body work session integrated with massage that are super YUMM & transformative to receive. I source my resonant therapists that live in giving plenty of opportunity for us to co-create vibrant, seamless living in the highvibes as a every day conscious expression. Life is one big party of consciousness for us as we grow and uplift our vibe together within community and extend that to all clients and services provided. I feel immensely blessed and honored to Source the Visionary Network in New Zealand and expand our Global Visionary community. It is a testament to our collective celebration of living on this exceptional Earth, co-creating our new stories together like extreme vitality, abundance, beauty, passion, connected community, clarity, peace, confidence, innocence, magic, love & Light. This is just the beginning!!! You can connect with me at www.hivibeliving.com and www.mountainviewmassage.co.nz or join our expanding local & global Source Living community on Facebook or fill out our contact form. Soleira, Mary Jo. Nancy & Andriana hosted a call with the New Zealand visionary community to get an overview of our work and how that applies into sourceful living. You can listen to the call here by clicking on Download File or right click to save it to your computer to listen later.